Pink ribbon cancer awareness seed bead necklace and earrings set. 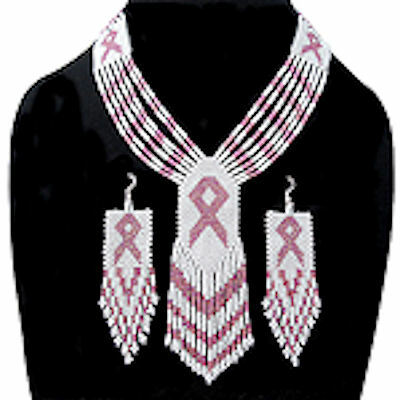 They are hand beaded with hundreds of pink and white seed beads to create this awareness design. Necklace is 19.4in to 23.1in. long and 1.4in wide. (49.3cm to 58.7cm long and 3.6cm wide). Earrings are completed with hypo-allergenic french metal earwires and are 4in. long and 1in. wide.(10.2cm. long and 2.5cm.wide). Priced each but sold in multiples of 3.